Savory barbecue potatoes are a staple around here. BBQ potatoes go great with beef but we just had them with grilled fish. Take your potatoes and dice in chunks, The larger the chunks, the longer for them to cook so don't make them too big. Put them in a bowl. Pour in enough oil to coat when stirred but first add some barbecue rub seasoning (that's the secret) and some season salt and pepper. Be generous and stir to coat well. Next take two long pieces of foil layering in opposite directions and then fold up the potatoes in the packet. Take your barbecue foil packet and place on the bbq. We cut up four large Russet potatoes and they took about 40 minutes. 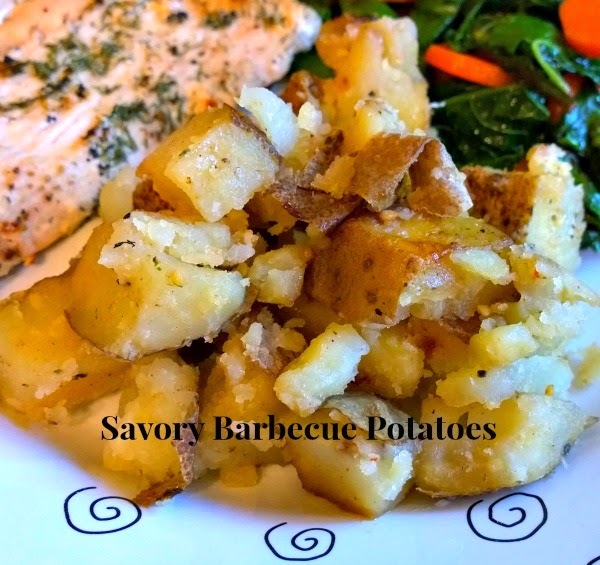 Remove when fork tender and let sit about five minutes and then enjoy the steaming savor bbq potatoes. Oh, and any leftovers make a wonderful morning hash brown cooked up with eggs. Sounds yummy! What brand of seasoning do you use? Yummmmm you think of the best yummy, simple recipes! I could use up my leftover homemade rib rub on the potatoes when I make baby backs! ... wow... This sounds so delicious.. I'm definatly doing this... Thanks for the recipe... Hugs and Blessings..